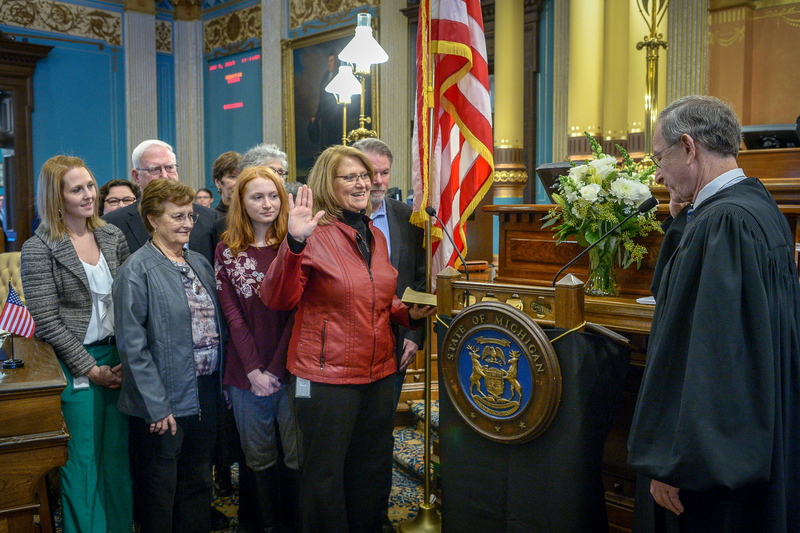 LANSING, Mich. — State Sen. Lana Theis was sworn in as senator of the 22nd district on Wednesday during a ceremony at the state Capitol. Michigan Supreme Court Chief Justice Stephen J. Markman administered the oath of office. Theis was joined in the Senate chamber for the occasion by her husband Sam Theis, daughter Gabrielle Theis, Mom Sharon Tieman, Dad Duane “Dew” Weldon, stepmother Marge Weldon, and staff members Meghan Reckling, John Forest, Thesera Grace, and Sharon Lollio. Theis’ office is in the Senate’s Binsfeld Office Building, Suite 7400, located at 201 Townsend St. in Lansing. Residents may contact the senator by phone at (517) 373-2420, via email at SenLTheis@senate.michigan.gov, and by U.S. mail at Sen. Lana Theis, P.O. Box 30036, Lansing, MI 48909. The 22nd state Senate district includes all of Livingston County and western Washtenaw County.